Adults: $20 / Youth (7-17): $10 / Children (6 and under): Free. 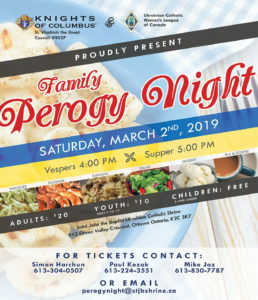 You’re invited to our annual Family Perogy Night on Saturday March 2nd! Supper will begin at 5:00 PM following an early vespers at 4:00, and will include perogies, sausage, kapusta, salad and dessert. There will also be a raffle and door prizes. $20 for adults, $10 for youth aged 7 to 17, free for children 6 and under. Tickets are being be sold downstairs after both liturgies, or you can contact one of our ticket sellers (see poster) to reserve your tickets today. All profits will be put towards the new church boilers! We hope to see you there. View and respond to this event on Facebook.